While the Gujarat government has been claiming that its public debt – which is slated to reach Rs 1.69 lakh crore by the end of the current financial year (2014-15) from Rs 1.50 lakh crore in the fiscal 2013-14 – is “well within limits of its paying capacity”, an independent budget analysis institute has brought to focus a disturbing fact: While the principal amount for paying debt has been going down over the years, the total amount payable as interest against the debt taken by the Gujarat government is showing a progressive upward trend. 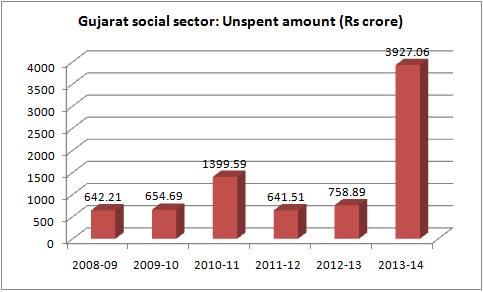 At the same time, the budget analysis suggests, interest as percentage of revenue expenditure of Gujarat is one of the highest in the country, and the state government is increasingly finding it difficult to spend amount allocated for the social sector. 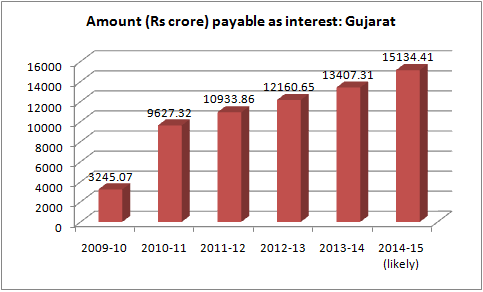 In the financial year, 2012-13, the Gujarat government had to pay Rs 6,536.52 crore as principal amount, and the interest paid by it that year was Rs 12,160.65 crore. In 2013-14 the principal amount went down to Rs 6203.07 crore, but interest went up to 13,407.31 crore. In the current financial year, 2014-15, the principal amount is estimated to further go down to Rs 5,511.97 crore, while the interest payable is likely to reach an all-time high of Rs 15,134.41 crore. All this happened, sources added, despite efforts by the Gujarat government to “negotiate” interest rates with different banks from which it took loans in order to bring down the rate of interest. What is particularly astounding, according the Pathey analysis, is that while the total public debt of the Gujarat government has been going up every year, reaching Rs 24,897.85 crore in 2014-15, from Rs 19,989.50 crore in 2014-15, it would have to spend a huge amount – Rs 20646.38 crore – to service the debt -- principal amount plus interest. It would mean, in the year 2014-15, just about Rs 4,251.47 crore would be available from the public debt it would take to fund the budget. The analysis has been carried out by Pathey, a non-profit organization based in Ahmedabad. Revenue expenditure is supposed to the amount a government has to necessarily spend to maintain its day-to-day expenses, including payment against salaries to its employees, maintaining roads and other public works, and so on. Interest payable on debt is an important component of revenue expenditure. Quoting Reserve Bank of India (RBI) data, Pathey says, Gujarat is one of the top states of India whose interest amount as percentage of revenue is very high. 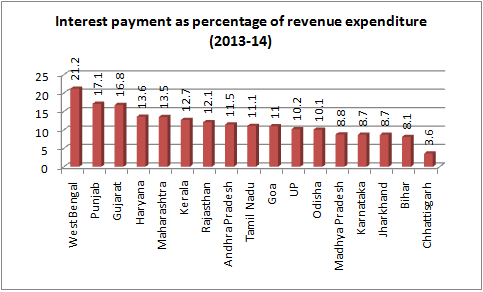 In 2013-14, the interest amount payable to service debts, Rs 13,407.31 crore, was 16.8 per cent of revenue expenditure, which was lower than only two states out of the 17 selected for analysis – West Bengal (21.2 per cent) and Punjab (17.1 per cent). Huge claims were made recently that Gujarat budget in the post-Narendra Modi era “predominantly focused” on the social sector, which accounted for 39 per cent of the total plan allocation of Rs 71,330 crore. However, figures suggest something disturbing: In the financial year 2013-14, a whopping Rs 3,927.06 crore meant for the social sector remained unspent – this came to nearly 15.81 per cent of the developmental budgetary allocation for the social sector (Rs 24,831.34 crore). This was the highest percentage of amount remaining unspent over several years – 3.70 per cent in 2012-13, 4.27 per cent in 2011-12, 10.77 per cent in 2010-11, 5.37 per cent in 2009-10, and 7.25 per cent in 2008-09.